Coconut palm sugar can be a healthier choice and a better sugar substitute for highly refined or processed sweeteners, it does NOT taste like coconut, but rather more like brown sugar with hints of caramel or molasses. Also known as Gula jawa, coconut palm sugar has been one of my better discoveries. Coconut tree blossoms have been tapped for their sweet nectar in many places where coconut palms (Coco Nucifera) thrive primarily in Southeast Asia (Philippines and Indonesia). Coconut tree farmers pretty much have a choice of two crops either coconuts or the sap/nectar—since once the flower buds of the coconut palm are tapped for sap those particular buds will no longer mature into coconuts. However, once the harvesting of nectar/sap is stopped the coconut tree blossoms will then start to grow into mature coconuts once again. 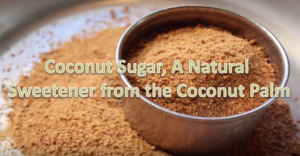 Coconut Sugar has a naturally low glycemic index (GI of 35) so is absorbed into the bloodstream slower than many other options such as cane sugar (GI 58-65) and high fructose corn syrup (GI 87-100). Coconut Sugar also contains a low glycemic carbohydrate called inositol—which is necessary for normal nerve function and thus is especially beneficial to diabetics as it helps to relieve diabetic neuropathy. 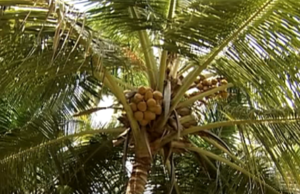 Many coconut palms are found in areas that have rich volcanic soils and thus can be relatively high in Vitamins, Minerals, Amino Acids (such as glutamine) and trace elements such as: magnesium, iron, zinc, potassium as well as vitamins B1, B2, B3, B6, B8 (inositol) and C.
B8 has been shown to be helpful for inflammation, high cholesterol, diabetes as well as depression. Coconut and/or Palm sugar can be found in your friendly Asian grocery.